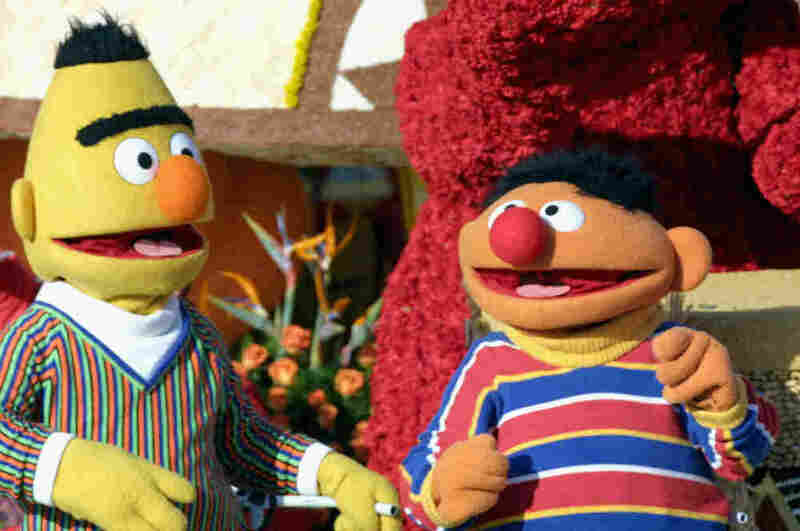 Sesame Workshop: Bert And Ernie Just Friends, Have No Sexual Orientation : The Two-Way The statement comes in response to an online petition that wanted the Muppets — males, who share a house and bedroom — to marry. Sesame Street's Bert and Ernie ride the "Music Makes Us Family" float in the 2005 Tournament of Roses Parade. This week, an online petition concerning Sesame Street's Bert and Ernie started making the rounds. The Facebook petition asked that Sesame Street allow the two male Muppets, who share a house and a bedroom, to be married on the show. "We are not asking that Sesame Street do anything crude or disrespectful," the petition read. "Only that they allow Bert & Ernie to marry or even add a transgender character to the show. It can be done in a tasteful way."